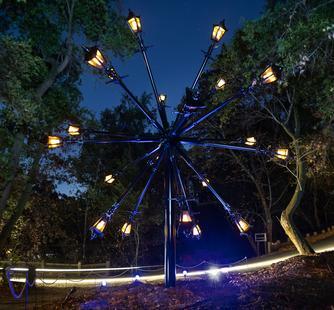 Inspired by the iconic lamp post, ever-burning at the edge of the Narnian woods, Good Seed welcomes visitors to Bruce Munro at Montalvo: Stories in Light. This starburst of light—which is part beacon, part seed pod, part icosahedron (a 20-faced polyhedron)—features 20 lamp posts extending 20 feet from a vertical anchor. With this work, Munro transforms the industrial into an organic form, re-contextualizing an everyday object to make it into something suggestive and otherworldly.